We delivered critical meds and relief packs literally on the wings of other nations. Through lent planes, managed by lent soldiers and staff. Here when we needed them most. Our gratitude to ALL the armed forces of nations who helped us during the wake of typhoon Haiyan. 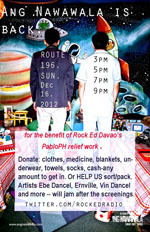 For updates regarding Rock Ed's relief ops on the ground, please just refer to our Facebook page. 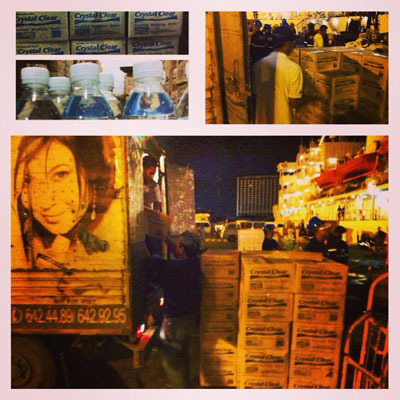 The main food/water bulk we usually send via the Phil Navy to Tacloban/Leyte will resume on Monday. Thank you. 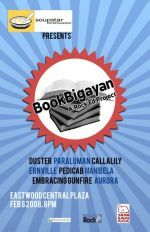 This post is from a series of animated videos marking the 40th year after the declaration of Martial Law in the Philippines. 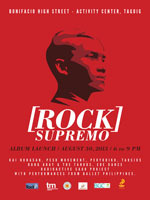 This is a joint project of Rock Ed Philippines, the National Youth Commission, and the Commission for Human Rights. It was designed to remind Filipinos of today to take care of the freedom we enjoy today - and to salute those who fought so hardly for it. June 12. 8PM. 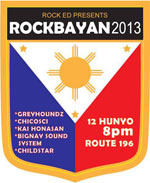 Route 196, Katipunan Extension. A series of gigs for clean and honest elections. Find out more at twitter.com/rockedradio. The National Historical Commission of the Philippines and Rock Ed Radio present this fully animated music video of the Philippine National Anthem. MAGKITA-KITA TAYO SA QUIRINO GRANDSTAND! Araw ng Kalayaan. Rakrakan. Araw ng Kalayaan mga kaibigan. June 12, 2012. 9pm, wag kalimutan. Malayang Pilipino! Isang concert sa Quirino Grandstand. LIBRE! Invite us to your school. Tell us about your project idea. Call us if you have resources you’d like to share. Write us about your public school’s needs. Talk to us through our radio show. Tweet us your announcement. Help us promote HIV-awareness and safety. Suggest how best to raise funds for vaccines. Give us your old books. Send over your old sporting equipment. Tell us where to give your clothes. Collect school supplies on your birthday and give them to schools. Donate pad paper to your neighborhood public school child. We are Rock Ed Philippines. We’re a coalition of several creative groups and individuals. Visual, literary, and performing artists, young professionals, educators, the creatively unemployed, freelancers, corporate hounds, IT experts, film makers, medical professionals, athletes- mainly private citizens comprise the core group. We have always maintained that no one in an elected or appointed government position can actively participate in Rock Ed's administration. 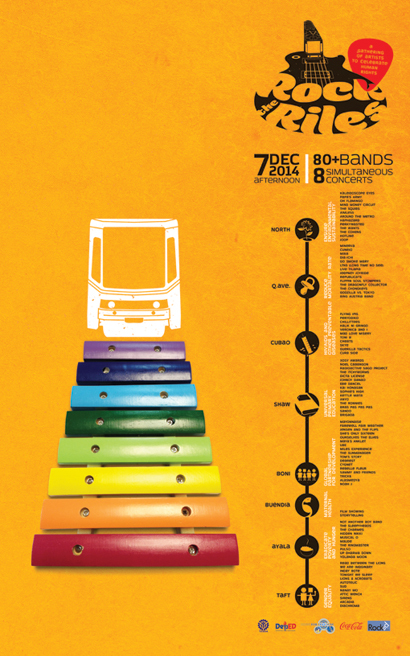 This Sunday December 6 - 8 Metro Rail Transit (MRT) stations will host 8 simultaneous gigs. Over 120 bands are participating. Performing on platforms or beside turnstiles. 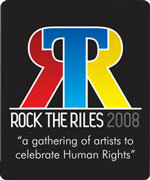 Rock the Riles 2009 is on. We know you do this before you date. Before you break. Before you choose which shirt to wear. Before you choose which course to take. Before you choose what to say to whom. For bigger things, you do this too. This summer we are encouraging you to think of your own project. It need not be grand, it just needs to be original. Completely yours. In exchange, nine (9) original ideas will be funded by Rock Ed through a grant given to us by Havaianas. Rock Ed Celebrates Batch HS 2009! A majority of our projects came to be because of the volunteer roster. We understand that this is an unusual route for a volunteer group. Instead of the project preceding the people, Rock Ed’s trend has been people come in first before projects. So, the idea of “Project: FRESH TAKE” is exactly that –a mere reaction to the existence of our many volunteer photographers. Since partnering with NOKIA Philippines at the onset of this year, our group has been able to provide and sift through hundreds of children from Childhope Asia and the Virlanie Foundation. Having to make the difficult decision of focusing on 40 children with artistic potential and the propensity to learn discipline and commitment in the process.